The frozen desserts industry belongs to the frozen foods category. Desserts are usually enjoyed at the end of a meal, but may also be served as a refreshment or palate cleaner enjoyed between courses. No matter how or when they’re served, one thing we can be sure of is that those among us with a sweet tooth look to desserts as an indulgent way to satisfy our needs. The frozen desserts industry comprises categories such as regular and low-fat ice cream, frozen yogurt, sherbets, and other frozen sweet treats. Industry statistics show that ice cream and frozen novelties had combined sales of 2.76 billion U.S. dollars in 2018, making it the largest frozen food category. 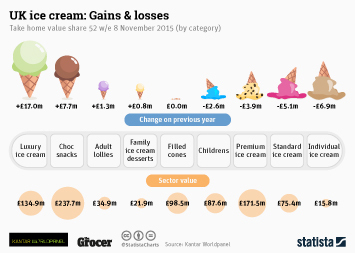 With an annual sales growth of 7.2 percent, the category ice cream / sherbet has put a smile on both manufacturers’ and retailers’ faces. Frozen novelties also showed a positive growth trend during the time period considered. Private label brands in particular outsell branded products in the ice cream aisle, holding a market share of about 20 percent - as shown in the brands ranking. Frozen yogurt, ice cream’s sour and less-caloric cousin, has also garnered a cult following among U.S. consumers, with private label frozen yogurt sales exceeding 51 million dollars as of January 2017. Overall, ice cream was estimated to be consumed by just over 290 million Americans. In 2017, the per capita consumption of frozen dairy products amounted to 23.1 pounds per year. Although store brand ice cream is the most widely purchased, Ben and Jerry’s is by far the most preferred brand amongst both men and women in America. Another fun fact: July is national ice cream month in the United States. More interesting topics from the industry "Sweets & Snacks"